I struggled for months with creating this new site and beginning to talk about the book I’m writing. The larger question we all ponder is how our circumstances and gifts could be best used to this end. Months ago, a childhood friend sent me a book written by Emily P. Freeman titled “A Million Little Ways: Uncover the Art You were Made to Live.” I know it was a nudge from her to consider I might be stuck in my long and painful journey writing occasional posts on a little blogger site because it was safe. She also understood any aspiration for something bigger would be plaguing my heart, because motive is something I live and die by. Is shining the light He created in me toward Him through the story He is writing in my life something pride or selfish ambition are inevitably at the center of? Could I ever see growing my audience and publishing a book as obedience to His call and a way to deeply glorify God and enjoy Him? I spent ten weeks in late 2011 through early February of the next year at a beautiful lake house recovering from my brain decompression and first fusion. My husband gifted me with the above beautiful piece of art by Kelly Rae Roberts. I would move it around to ensure she was facing the sun as it changed positions from dawn to dusk in this cathedral of a home with a wall of windows. I consider the time I spent there one of the holiest and most soul changing experiences God has ever given me. I collaged a vision board for my heart’s desires. I prayed for hours. I read for hours. 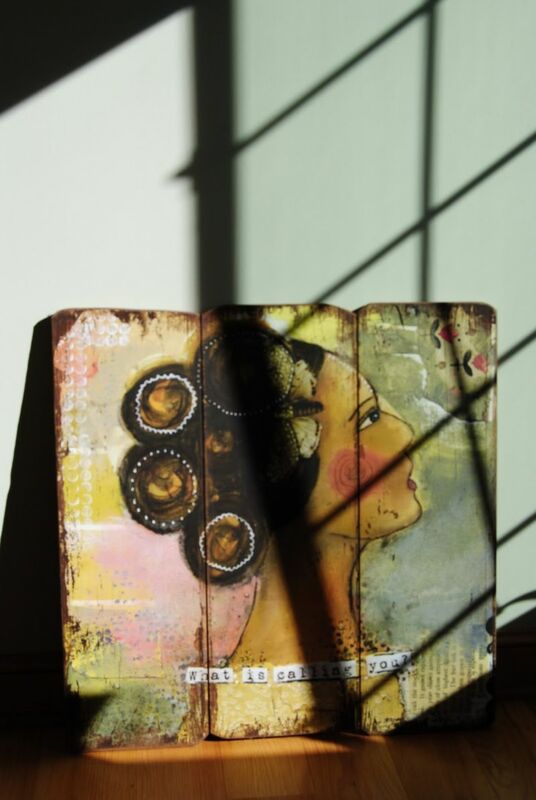 I blogged some, and I wrote prolifically in my personal journal. I knew then I was supposed to write this book. I returned to the dark basement in my parent’s home. I had so many health struggles in front of me, and I felt the Shekinah glory fade away. I began to doubt God, myself and the journey. I wasn’t just hiding my light under a bushel. It almost went out entirely. Emily writes about a short essay C.S. Lewis penned called “First and Second Things.” He said this, “Put first things first and we get second things thrown in: put second things first and we lose both first and second things.” She elaborates on her own struggle about desires and calling. Where I’ve run into the most confusion, though, is wondering what it actually means to bring glory to God as a first-things pursuit. It isn’t just me on my knees in an empty room with my hands lifted in the air. It can be that, but it isn’t only that, and I would dare say it isn’t usually that. How are human beings to reflect the glory of God in the world? I have been tempted sometimes to throw every single desire I have into the “second things” pile for fear they are things I’m making up. I tend to assume if it’s something I really want, then it isn’t something I should be allowed to have. Am I just being selfish? Greedy? Crazy? It takes courage to honestly consider desire in the presence of Jesus. Am I brave enough to acknowledge what I most long for? Am I willing to expose my desires in the light of the love of God? As we begin to uncover the desires we may be reluctant to face, remember the Gospel makes it possible for us to confront whatever we see. Christ is intuitive enough to sort out the first and second desires on our behalf. The timing is now. I’m obeying His providence, His provision and His gift to shine. Is there a desire God has placed in your heart you have been fearful to pursue? Comment below about a way God could shine through you to accomplish good works and glorify Himself. Share this post or invite someone to join this journey. I am giving away three books I love. 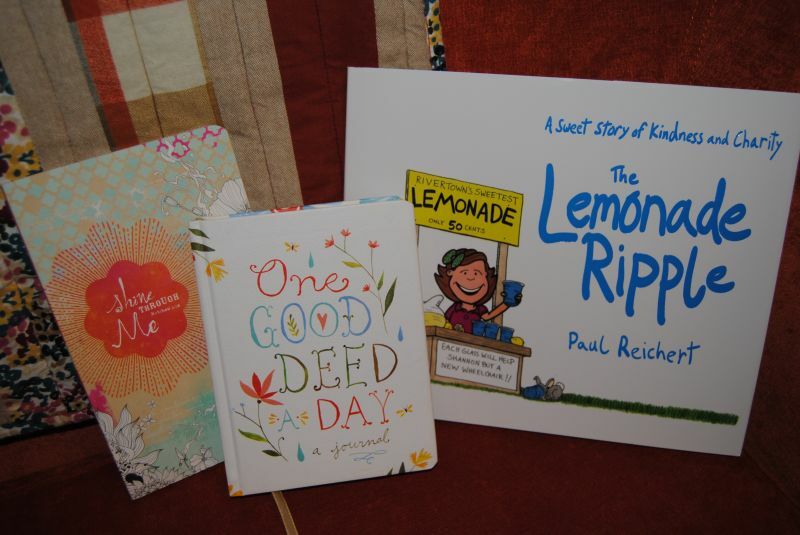 “The Lemonade Ripple” is a children’s book by Paul Reichert about how small acts of kindness ripple into big waves of love. “One Good Deed A Day” is a journal with simple suggestions every day on how to reach outside our little worlds and do good. “Shine Through Me” is a journal full of Scripture and beautiful quotes with lots of room to write about what is calling you. The winner will be chosen randomly from all comments. The giveaway will close midnight on Saturday, 11/15/14, and the goodies shipped Monday morning. Look for a post tomorrow about creating good through our specific gifts. You don’t know me, but I had heard about your story and found your previous blog through a mutual friend on facebook. As a person with faith who suffers from chronic pain and has 2 young daughters, I related so much to your blog posts. I just wanted to let you know that your story and incredible faith has helped and inspired a complete stranger. Many days I would read something you wrote and it would help me to keep fighting and to remember God’s hand in my life. You are an incredible example of how to hold onto your faith and glorify God during trials and suffering, and also a wonderful mother despite it all. Thank you for your honesty and incredible strength. I just hope you know how much you have touched and influenced many people, some whom you have never met, such as myself. Keep up the good and hard work that you are doing! It does make a difference! Wishing you the best of luck in your new endeavor and a healthy, peaceful year to come. I forgot to answer the question you asked above! One way I have seen God shine through me to help accomplish good works is through everything I have learned through my physical suffering. 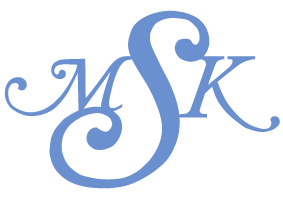 I am a Physical Therapist and though I am not able to work much, due to my health issues, I have been blessed to be able to help many others with their physical and emotional suffering through what I have learned in my own experiences. I have seen countless answers to prayers in my own life, and how He connects us to each other at the right time so we can be answers to someone else’s prayers. That has been a way that God has inspired and worked through me to help others. It’s something I am very grateful for, despite all the pain and struggle that has brought me to where I am. Monica, I am so proud of you, and so happy for you! In your words I hear a different woman than I heard in the past. This is good. :). Maybe because I am that way. Maybe that is the model I am showing them. If I let God shine through me by doing more for others, there would be a ripple effect…it would change the way they look at the world. It would change the way they interact with the world. And surely, their actions would have that same rippling effect on their friends. It is something I have been considering for some time now…perhaps it is time to step up my game, huh? Congratulations on your new endeavor…and I can’t wait to read the book when it comes out. Monica~ I cant tell how on point & annointed this eloqent, stunning expression of Him shining through you is to me right now. I have a similar story concerning writing, that only became apparent in the last 7 years while processing the depth of suffering I’ve endured as an adult. It was truly like an awakening. I’m not certain where it will all go with me. But to see your expression is amazing, both inspiring a sense of trepidation & exhiliration as I feel encouraged, nugged. You see, until the past handful of years, I lothed writing! It was like pulling teeth, even to write a simple letter. Yet somehow, God has seen fit to begin allowing me to give expression to my internal processing of His handiwork through writing. Thank you for being courageous, transparent, and lighting the way for others to come alongside & to follow. You are indeed a gorgeous sister/friend, both inside & out. Much love & many, many blessings as you launch into this exciting season of writing. Suzanne, Thank you for your affirmation. I know for sure your story has worth and should be written. God tells us, “Let the Redeemed of the Lord tell their story.” Just the process alone can be heart and life changing. Documenting for your family and others who love you will be lasting. Flannery O’Connor wrote in one of prayer journals, “Start with the soul and perhaps the temporal gifts I want to exercise will have their chance; and if they do not, I have the best in my hands already, the only thing really needed. God must be in all my work.” Much love to you. Strength. Healing. LOVE. Mine is writing, too. Right now writing seems impractical to pursue because I have young, energetic children at home and little time or energy to commit to sustained and focused creative practices. I’m also held back by fears: that everything worth saying has already been said; that I’m really just mediocre in craft and ideas; that I won’t be able to bear the vulnerability and nakedness of sharing my writing with others; that my words and ideas will be met with silence, or worse, be shamed with biting criticism; that I don’t understand how to find and develop an audience; that I will have to self promote; that I am not well-read or well-informed enough; that my endeavor will be –in appearance or fact — narcissistic and self-serving. And more. I dabble, hope, wait, say “some day”, work on my thought life and turn ideas in my mind. I love your courage to go forth bravely. You do have a gift. I am thankful you’re giving it. Jillian, I was on retreat in Tuscon, Arizona this February after a second brain shunt operation. I read Brett Lott’s book “Letters and Life: On Being a Writer, On Being a Christian.” I must have underlined every word in the book, but this quote in particular was a direct conviction from God at that time. “We as believers must see there is no one save Satan who stills our fingers over a keyboard when we, with fear and trembling, begin to write our “human attestation” to the role of Grace in our lives.” I have felt all of things you speak of. I never considered I was being disobedient or hiding my talent in the ground. I actually thought maybe there was some piousness in the kind of humility I wanted to express. I know now it was in reality pride and fear. Write anywhere. Scribble sentences in your days and nights between cheerios and legos. Know your words do not need a vast following or even traditional publication to point others to Christ. My little Team Danica showed that real hearts and lives were heading to Him through my feeble effort to lament and praise on our journey. Is one soul enough to make your effort of worth? Two or three? Only eternity will reveal the other side of the tapestry He is weaving. God loves narrative. Thank you for your encouragement. Listen to the desire of your heart. Commit your way to Him. Do the work. He will bring it to pass! Much love. Monica, I am thankful to God for having allowed our paths to cross. You have been a blessing, encouragement, inspiration that we can do all things through Christ. You are loved I am blessed to be your friend. I love you sister! I love being able to see and read your heart on your new site, and I love reading how your blog and life have blessed others in so many ways! I know God has used our journey to parenthood, infertility and adoption to speak to others. Also, the things we have learned in our efforts to help Riley, that we have been able to pass on! God is good! Dream big, believe big! My handy dandy random name picker chose Kristen Johnson! I’ll be in touch for your mailing information and get your package mailed tomorrow! I have a super fun box of goodies giveaway coming up soon. It’s going to be the Christmas box you wish your friend or husband would know to make for you only you have to enter yourself and nominate friend to be eligible. Be thinking of someone in your life who could really use a Christmas surprise. Keep your eyes open for ordinary miracles!